Synopsis: Approximately one year after the events of Halloween 4, Michael Myers is back on Halloween night to try and kill the last remaining member of his family. This time, though, the town is ready for him. Review: With Halloween 4: The Return of Michael Myers performing so well at the box office, it was a given that another sequel would be put into production. The cost to produce these films was so cheap that it frankly was a no-brainer to keep the series going until they ran out of William Shatner wigs or relatives of Myers to knock off. 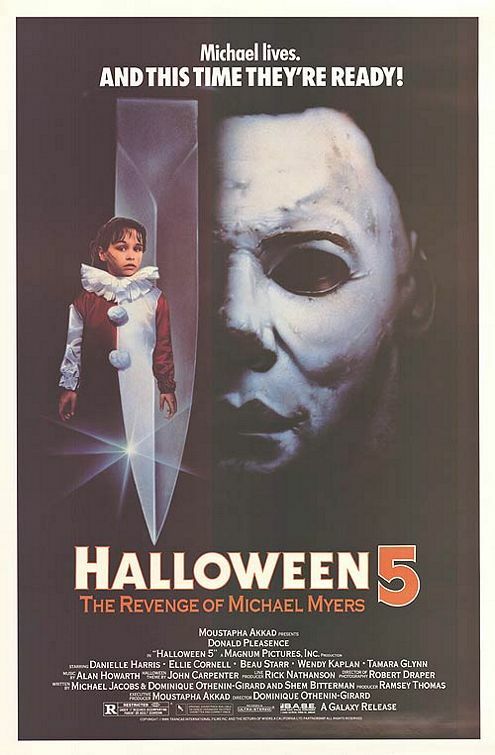 Made and released exactly a year after Part 4, Halloween 5: The Revenge of Michael Myers spoils most of the good will that its predecessor earned in service to the ever mighty dollar. Like Halloween II, Halloween 5 picks up right at the end of Part 4 to create one continuous story. Myers has escaped yet again and spends an entire year under the care of an old hermit that pulled him out of a quarry. How Myers knows that Halloween has rolled around again is anybody’s guess but before you can chop up a pumpkin with a carving knife he’s donned his mask once more and is looking for his niece Jamie (Harris) again. I’m going to tread carefully here so as not to spoil the wicked twist of Halloween 4: The Return of Michael Myers but let’s just say that Jamie ended that film on a sour note. What could have set the stage for an interesting exploration of generational traits instead is pretty much forgotten – it’s as if screenwriters Michael Jacobs, Shem Bitterman, and Othenin-Girard (who also directed) didn’t have the cojones to really go to a dark place for this round. To be fair, the previous film painted any future sequels into a corner so with a small acknowledgement of the events at the end of 4, Halloween 5 just moves on its merry way. That leaves the film to become just another brainless sequel putting Myers in impossibly well-timed appearances to do his dirty work. Some of the things the quiet killer does in this entry are beyond the scope of believability and I can’t help but wonder what creator John Carpenter thought of Myers hunting people down with a souped up muscle car instead of his faithful knife. There’s no rhyme or reason to his stalking here…he does what the script tells him to do without any point. It’s a pretty sad state of affairs we find Myers in. Even more embarrassing is Pleasence being subjected to this abject low-brow filmmaking. I’m not sure if he was contractually obligated to be in the movie or did it for the hell of it but he doesn’t look entirely convinced of what he’s doing going another round with the same killer. Aside from Pleasence and an improved performance from Harris, the rest of the cast is dreadfully rotten with Kaplan turning in a most annoying performance of a character we’re supposed to like. Even the actor playing Myers looks like he’s asleep behind his mask and who can really blame him? Though it does pick up at the end with a sweaty palm inducing chase though the dilapidated Myers house and a baffling yet intriguing ending, most audiences will already have had their fill of the expired candy that Halloween 5 is giving out.